For the last year I've watched my son, 6 years old, become a boy of prayer. He has never rushed through prayer when it was time (meals, bedtime) and always has put thought into it, and almost always prays for others more than himself. The other day we were talking about many subjects but one is about the missing lunches at school. Someone has been stealing packed lunches, and several kids have taken to playing detective trying to figure out who it is. Calvin was a victim of a similar theft. While we were talking, I brought up how one time Calvin's shoes went missing, or if he leaves a ball out it'll be taken, and we talked about loving our enemies. We talked about how when we dedicate ourselves and even our stuff to God's work, that when people take it, they're making an enemy out of God's people, and thus God. So if these people are technically our enemies, and when they take stuff we get mad, how can we love them when we really want them to come to harm? both of them replied "no"
"Then I think, we can love our enemies best by praying that they find Christ as their Savior, if that means getting caught... or if that means reading a Bible they stole, whatever it means, God knows what He's doing, even if sometimes things make us sad." Well... as I said these things to him, I was convicted myself, and even further when Calvin led us in prayer for them. "today your son led a prayer, and many children and teachers were around, and he prayed for the souls of the raskols who steal things, that they would find Jesus. It was incredibly moving to us adults." This was a room with people in it who have suffered loss at the hands of raskols here. It is a reality anywhere you live that you will have people who oppose you. And my son was sitting there not knowing the ramifications of his actions, and how he was touching people's hearts. did God send us here so that our kids could minister or what? I mean seriously... at age 6 he's impacted a room simply through his remarkable desire to pray to God. I'm constantly blessed (and challenged) by my kids... and I do thank God for them daily. I am writing to let you know that the NAS back-up device that you set-up for [training course] has failed. We are no longer able to power up the device. There was a huge power surge just outside the [building] last week and one power line went up in flames. However, no other electronic equipment was damaged so we don't feel that this was the cause of the problem, particularly since the UPS that the NAS was plugged into is still working fine. [Man] and I did take the covers off the NAS, and we found that a gecko had layed eggs inside. There were about 4 eggs and one small baby gecko carcass which was nicely fried. We assume that this has more to do with the malfunction. We hope that CTS is able to repair the problem, however, since we have [important information] and language data backed up on the device. I have packaged it to come to [you] on the next flight. Please advise. You chuckle at first. I heard tale of a mouse downing a server back at Sun Microsystems so you can't completely upset at the Jungle. I suppose it was a nice... warm place. Too bad no one ever taught the geckos about the dangers of electricity. It is important for us that you count yourself as part of "we". As we work on computers or run sound for services,teach children or host bible study or whatever it is we do, YOU are part of WE. As I lift the volume on someone speaking, I'm supporting them communicating their message to the room. As you pray and financially support us, as you write us, we are supported, you lift us up. But as I press keys and turn knobs, I usually see an instant result. For many of the translators there is not an instant result. Their work is hard. Today during our morning of prayer, where the community gets together for 3-4 hours of prayer, we heard a few stories. I will highlight 2 shortly. One translator couple early in their project, (which can be over 20 years) had a run in with bees. The wife got stung as a child and never had a reaction, but in the village 20 years ago, she stepped on a bee, and went into an allergic reaction. She watched as the poison spread up her leg and she swelled, went numb, and was told she couldn't stay. Years after that occurrence they delivered the first translated book of the Gospel to their language group. The people were less than enthused, no one was interested. It was greatly discouraging to them (this is where support staff play an important part, in encouraging, and helping.. outside of their normal job). Years later, they returned with a finished translation of Luke. A church service began and the time for testimonies was called, all the nationals gave head nods to the husband as if to say "time to read from your new Bible!" Now normally this church didn't have youth in it, but this time the church was packed with young and old alike. So he stood up, and passed out the Luke in their language. As he read people began to laugh, women were shaking heads in agreement. There was such an overwhelming response because people were happy to be reading the world. There was laughter and joy and excitement. In the same way the first bee sting she received didn't have an effect, neither did the first translation they did. However the second one, slowly built until it changed a community, infecting it with God's joy! It's a ministry of endurance. The second story is a 15 year before and after. When this one couple got to their assignment (we'll call him Mark), the husband and his friend needed a guide to get to a village. NO one was interested in guiding them, not for pay, not for anything. No one was excited about the prospect of getting the Word, or a landing strip. It was utterly discouraging. SO.. the two men, left their wives to try and go into the jungle alone without a guide. Tom and Mark asked "at least, point us in the right direction?" And they went out into the bush. Two days of rain, getting totally lost, and dehydrated, they wandered around in the jungle. They finally found a stream and followed it to a river, which they had to hide from a crocodile, and arrived in bad condition, at the village they were aiming at. For two days these men were lost in the jungle. Imagine the discouragement and sense of failure during this time. You've trained for years, raised partners and support, and stepped out.. and the people... aren't glad you came, to top it off, you nearly die out in the jungle, lost. But God prevailed. 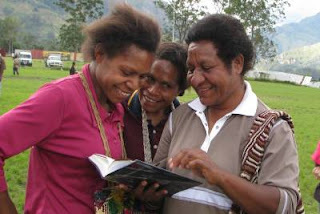 15 years later, the New Testament was delivered to a people who not only were excited for it, but could now read, had dictionaries, and it completely changed the entire village and surrounding areas. As discouraging as it was for Mark that first trip, was how encouraging it was for their final trip. The change in the heart of the people because of God's Word was overwhelming. This is God's work, WE (you, me, and the translators and everyone involved) are honored to be involved in it. Thanks for being we with us. We don't really know what they are called, so we call them Beef Ants. Other folks call them sugar ants because they are so small and like sugar. Except for our house. In our house, the ants are weird. They huddle around a speck of meat but will completely ignore the sugary spills. No dropped morsel of meat goes uneaten in our house! I'm not the brightest banana in the bunch. Never have been as smart as my family members, friends, co-workers nor students. One thing I have never forgotten is that hard work, and a learning attitude go further than an education sometimes. I have a college degree, and I don't claim to be stupid. I can reason and think clearly enough for any man. But I do not have the... super brain that many of the people around me have. I'm very curious and I LOVE asking questions and learning new things. Which is why, living here, is like a kid in a candy store. I ask questions from Bible scholars, I ask questions from car mechanics, aviation mechanics, pilots, children's home parents, directors, electronic technicians, telephone managers... everyone. This place hires and attracts nerds, geeks, and otherwise very intelligent people. So when I ask a question, hearing the answer is often like drinking from a fire hose. I love it. I love the wealth of information available here. I love the talents God blessed people with ... all pooled together for a common cause. I love passionate responses, I like to see where God has inspired people to act and serve. I jsut generally enjoy the people. I guess I pretty much enjoy people everywhere. I enjoy the people back at home too, conversations we've had, watching people in ministry. Generally I've been blessed by being surrounded by quality people. Thanks for being a quality person. today I found out that my department repairs eyeglasses. "I've got a screw loose." well, I cracked myself up as soon as I heard myself say it, and took a moment to laugh.. and then realized, they had no idea of the idiom, nor why I was laughing. "I've been accused of that for years." I heard another ex-pat explaining the term to them as I left, absent-mindedly forgetting to interpret myself.